On Saturday November 23, sixty students representing six Tampa Bay area colleges came together to network, share ideas, and build a framework to address climate change locally. The Tampa Bay Student Sustainability Summit was facilitated and organized by a group of Sierra Club interns and their theme was “Think Globally, Act Locally.” The three hour event was designed to bring together the best and brightest community and student leaders for a day of sharing, planning, and collaborating. Climate change is real, is getting worse, and it’s related to human activities. The students agreed that in order to address climate change and build a resilient community, local leaders must come together to collaborate and ensure that we aren’t operating alone in our respective silos. Many students are putting significant time and energy into sustainability projects on campus but how can they channel some of their energy into a community and regional focus? On the flip side, community groups are hard at work at the community level but how can they utilize the enthusiasm and creativity that is so readily available among our youth leaders? The students invited representatives from environmental non-profits, as well as student leaders from every school in the Tampa Bay area, to share their perspectives. The day started with inspiring presentations from local community groups working on everything from clean energy to open space preservation to urban agriculture. The community groups spoke on their organization’s priorities and the various ways students could get involved. Student leaders from area colleges then shared their own campus priorities with regard to sustainability. From education, to energy efficiency, to resource conservation, colleges and universities often serve as a beacon of sustainability and provide an important source of creativity and knowledge to their surrounding community. Many students are pioneering innovative solutions to address climate change and it was both inspiring and impressive to see youth taking on such enormous challenges. After the campus presentations, students and community group leaders broke into four focus groups: urban agriculture, clean energy, green transportation, and restoration/conservation to outline community priorities and build consensus. The day ended with a debrief session and the most important lesson that was revealed was the need for less talk and more action. The students raised the idea of creating their own Tampa Bay Student Sustainability Council that will work together to create an action plan to address the local causes and effects of climate change. Rather than working in silos and limiting their activism to their respective campuses, the students agreed to expand their focus and think regionally. It’s not just about sending petitions to the White House and fighting for good environmental policy at the state and federal level. Although those things are important and necessary, building resilient communities and reducing our carbon footprint can happen in other unexpected ways. Community gardens in low income neighborhoods, farm-to-school programs, energy efficiency, public transportation, and zero emission vehicles are just a few of the projects that the students agreed were most important. The Florida Panther Festival was a great success! Held at the North Collier Regional Park in Naples on Saturday, November 16th, the annual event, now in its 3rd year, brought together local communities to learn about Florida panthers. With over 1,500 visitors and 50 vendors and exhibitors, it was an incredible day. The Florida Panther Festival aims to raise awareness for the critically endangered Florida panther, while bringing together numerous stakeholders who work on panther issues. The objectives of the Festival are to "educate both residents and visitors to South Florida about the management needs of the Florida Panther and to heighten the awareness for the maintenance and protection of panther habitat through not only the core panther population area but practical expansion areas in Florida. To make the Festival a self-sustaining event that not only develops public and private partnerships but empowers the private community partners to become Festival leaders. To conduct the Festival as a free entertaining, educational, fun-filled event, combined with field-based learning opportunities. And to establish the Festival with interactive educational experiences that foster a broadened understanding of living and recreating in panther country and that promotes personal safety and the protection of livestock and pets." Ranging from non-profits and government agencies, to universities and orchards, the festival housed numerous stakeholders working to help panthers. A demonstration tent was set up outside to promote the use of predator-prooffences. People in panther habitat can house their livestock in these fences to prevent predation by panthers, bobcats, coyotes, and other predators. Numerous children's activities were set up, including face-painting, a petting zoo (in conjunction with the "Living with Panthers" display area), and an awesome panther mascot! A trail tour of North Collier Regional Park was lead by rangers from Big Cypress National Preserve, and allowed attendees to get out and explore nature. The following day, Sunday, was filled with field trips to areas known for panther sightings. Participants could go on a CREW "Passport to Panthers" guided walk, a Panther Bike Ride through Big Cypress, a buggy ride through the Florida Panther National Wildlife Refuge, and many other activities through out Picayune Strand State Forest, Fakahatchee Preserve, and Babcock Ranch. Overall, it was an incredible experience. Having so many dedicated people and organizations in one room was truly inspiring. So many people have dedicated themselves to raising awareness for panthers, and the Florida Panther Festival is a wonderful place to see all their hard work in action. It was the first time Sierra Club has been involved with the festival, and we can't wait for next year's event! 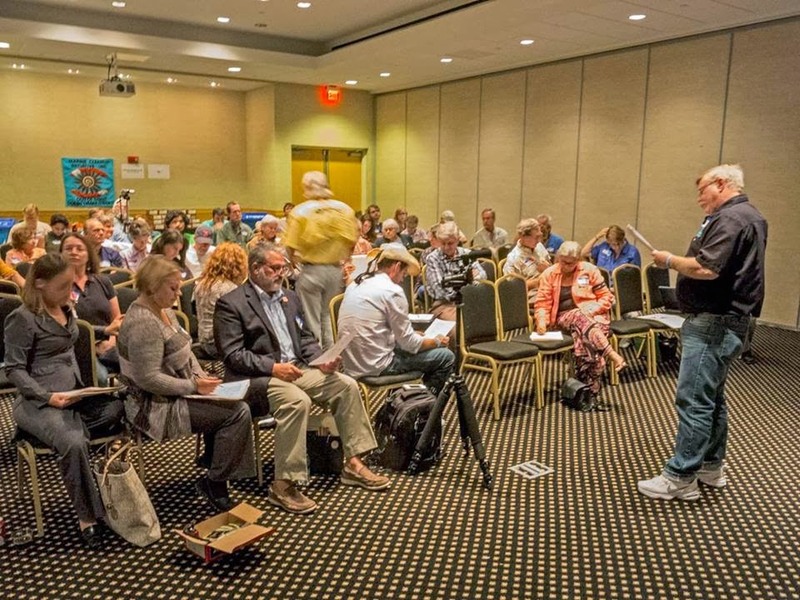 In one place, for one day water quality activists came together from every corner of the state on Saturday, November 16, at the Citizens’ Clean Water Summit. Why? 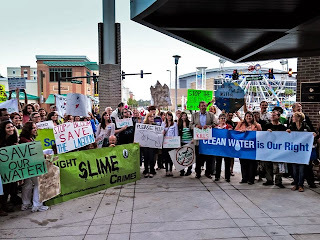 To build solidarity between the state’s independent regional water movements, to create a framework for regional and statewide collaboration, and to lay the groundwork for a progression of joint, grassroots mobilization events to bring Florida’s toxic slime disaster straight to the public and the elected officials who represent them. 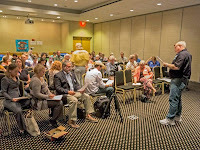 The Summit was an historic event; for the first time ever representatives of well-known statewide organizations and small local organization volunteers came together to share stories and ideas and explore ways to work together. We heard from each part of the state and each threatened watershed. The plan? Unite in a common effort to take on the state’s polluted waterways and the “powers that be” that allow the pollution to continue to flow into our beloved waters. League of Women Voters of Volusia Co. The Byrd Law Group, P.A. *Those in bold were involved in the planning of the Summit and/or provided speakers and/or workshop leaders. On November 13, 2013 more than twenty business, faith, labor, consumer, public health, and environmental organizations in Florida launched the Sierra Club-led Sunshine State Clean Energy Coalition to advocate for Florida’s largest utility companies to invest in clean, local solar energy. More than 120 members and supporters of the new coalition rallied outside Duke Energy’s Florida headquarters to call on the company, now the largest utility in America, to invest in Florida’s economy and future by choosing local energy solutions over imported, polluting energy sources like coal and natural gas. The new coalition aims to engage as many Duke Energy customers and stakeholders as possible during the next several months. St. Petersburg City Council Member-Elect Darden Rice joined Rick Smith, chief of staff of SEIU, and Tim Heberlein, political director with Florida Consumer Action Network, in calling for clean energy jobs in Florida. Tim Heberlein told the crowd, "By refusing to increase investment into renewable energy technologies like solar, wind, and geothermal, utilities like Duke Energy are denying investors access to domestic technology and manufacturing markets. This resistance to economic growth means that the United States is lagging behind countries like China, Germany and Norway in the new energy economy. When we invest in renewable energy as part of a comprehensive change to our state and our countries portfolio, we create new high-tech jobs, we promote policies that strengthen national security, we develop new vehicles for investment and economic growth, we promote the well-being of our natural resources, and we create REAL, long-lasting energy independence." Smith said, “The issue of clean energy from renewable sources is not just a matter for environmentalists but of the greatest concern for all working people. The future of our children and our children's children is at stake. We refuse to compromise either the economic or the environmental health of our communities." Duke Energy operates four coal-burning units at its Crystal River power plant in Citrus County, Florida. In recent filings to state regulators, the company has committed to phasing out coal burning at the plant by 2020, but currently plans to increase natural gas use at the plant instead. Rosemarie Grubba, a Hernando County resident, spoke to rally attendees about her activisim to close the Crystal River plant, saying “Now is the moment for Duke Energy to commit to leading the way to the future. This is the time to embrace clean and sustainable sources of energy in Florida and show America that there is a way beyond the pollution of petrochemicals!" By delaying its plans to phase out burning coal at the Crystal River plant, Duke Energy is choosing to produce four more years of air pollution, including toxic mercury pollution, which will impact children, seniors, and people living with asthma and other respiratory illness. "Pollution from coal-fired power plants affect all major body organ systems in a negative way and contribute to four of the leading causes of morbidity and mortality in the United States: heart disease, cancer, stroke and chronic lower respiratory diseases, like asthma. And sadly, children are the most susceptible members of our society to the detrimental effects of toxic coal pollutants. We must protect their health and quality of life through a cleaner, more sustainable energy future,” said Lynn Ringenberg, M.D., Chapter President, Physicians for Social Responsibility. The rally served to send a strong message to Duke Energy: it’s time to invest in Florida’s economy and people by choosing our homegrown energy resources over obsolete, expensive and dirty imported fuels. It’s time for the Sunshine State to see real investment in solar energy that will create jobs and clean up our air. This Saturday, November 16th, will mark the 3rd Annual Florida Panther Festival in Naples, FL. "The Florida Panther Festival is a free, family-friendly event designed to shed light on the plight of the endangered Florida panther through unique interactive activities such as presentations by panther biologists, a Living with Wildlife Pavilion, nature walks, children’s activities, a rural backyard demonstration, exhibits by various conservation agencies and much more. On the day following the festival, Sunday, November 17, a variety of field trips are available throughout southwest Florida where panthers roam. Various fees apply to field trips." Please join us and all the other organizations who work on Florida panthers for a fun-filled day of activities. Also, check out the amazing field trips taking place the following day. WHEN: Saturday, Nov. 16th. 10am-4pm. The deadline for the Citizens' Clean Water Summit has been extended!! Right now dozens of organizations from across the state and over 200 activists from Jacksonville to the Keys are going to be in Orlando NEXT SATURDAY the 16th. If you want to attend and haven't gotten your ticket yet, click below. Florida NEEDS clean water! Purchase your ticket today!